Part of the success of any business is knowing at all times the critical characteristics of your market in order to maximize opportunities, increase sales and profits. 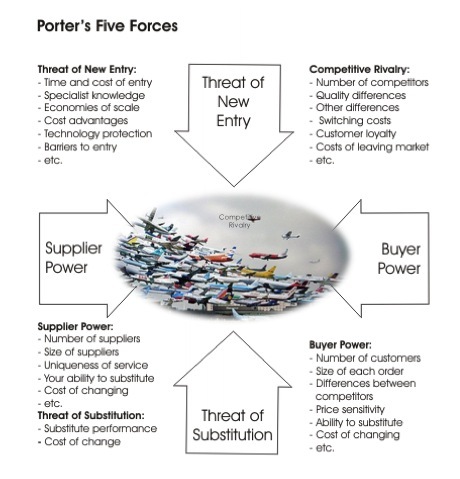 Regardless of the background of the company we represent – being airline, airport, local authorities or connected businesses, our market analysis follows the golden rules outlines by Porte's Five Forces Model embedding the know-how and specific attributes of the aviation sector. Why customers select your products over competitor's? What is the perceived value of your products/company and triggers the buying choice? What else do they look for when shopping for your products? If you want to understand how a lion hunts, don't go to the zoo. Go to the jungle.